Yesterday went as well as we could have imagined! We got to our appointment on time, started acupuncture, and got a visit from the SRM embryologist. 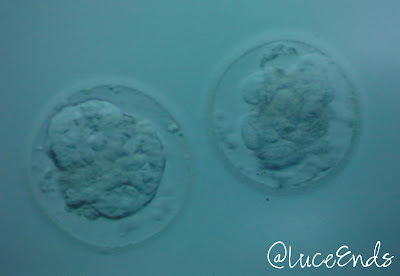 He gave us a picture he'd taken of two embryos after they had thawed and excitedly informed us that both had survived and looked very strong and healthy! A nurse and doctor came in and explained the process while the embryologist pulled our embryos out of the incubator and set them under the microscope. (He was in the lab just on the other side of the wall for the room we were in, talking with the doctor and us through a window, and showing us everything on his microscope.) He clarified with us based on the label on their dish that they were our adopted embryos. It was amazing to see how much they had grown since the picture he'd taken an hour or so before! I asked the doctor how big they actually were. She said it would take 10 of them lined up to make a millimeter, or about 260 to make an inch long line. The doctor squirted them in with the nurse's ultrasound guidance, then told me to sit still for 15 minutes. We had another round of acupuncture, scheduled a follow up appointment, and were on our way! We don't know yet if they have implanted and won't for a few weeks. I'm supposed to avoid anything strenuous for a few days (no gym), but then can go back to my "normal" lifestyle. Now we're praying for God's will to be done, for the babies to live and grow. Very exciting and praying for you all!